SIENA will support your quest for happiness and help you become who you are meant to be, setting the world on fire with your gifts, talents and fulfilling your deepest desires in the process. Participants will have the opportunity, if they wish, to meet with one of the facilitators on a one to one basis, during the course of the programme. 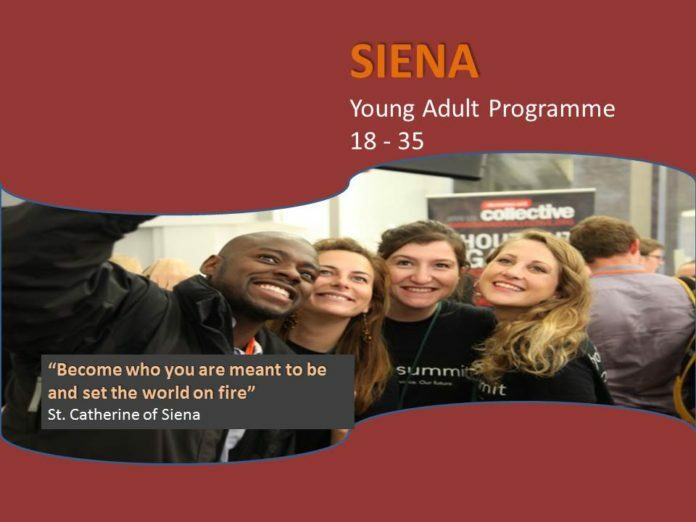 The SIENA programme encourages participants to form a group, in which each person will be supported by the others in a process of discernment and discovery. For that reason participants are asked to consider making a commitment to the whole programme. You are invited to set aside six Saturday afternoons 2pm to 6:30pm between November 2018 and May 2019 to take part in the programme. Discover your Talents, Deepest Desires and Legitimate Needs as you embark on discovering God’s call in your life and your quest for happiness. How does God relate to me? How do I discover in this relationship who he wants me to be and what he wants me to do? Where does the Church fit into this? Why get married? Is Marriage really a vocation? Why Celibacy and is it possible to live a celibate life constructively and creatively? Why are there priests & deacons? What is the life of a priest or deacon really like? What does a priest or deacon do between one Sunday and the next? What do people expect from their priests and deacons? In what way are things changing? Religious Orders and Lay Commitment:What is a religious order? What are vows and why take them? What shape does religious life take these days and what does the future look like? Living Gospel values as a lay person. Living Life with Passion and Purpose:What has come out of the SIENA programme for me? One life to live – making it count. The SIENA programme will take place in Sligo, Roscommon or Athlone depending on what suits best for those who register for the programme. It will be possible to rotate between venues also.